Our Business Person of the Year effectively leads a hard-charging public company in the fast-changing telecommunications industry. A few say “absolutely.” Others “wonderful.” Still others, “very,” “at this point in time,” “usually,” “extreme,” or “only.” We all in our vocabulary have a favorite adverb or adjective that we frequently send out to selectively season our standard speech. Pay attention to your words and those of others, and you will hear. John Finke, our Business Person of the Year 2009 and president of Mankato-based, $155 million HickoryTech Corporation, also accents his conversations with a choice word. It’s “certainly,” an adverb, which means definitely, positively, undoubtedly or unquestionably. In our Business Person of the Year interview here, we quoted Finke saying “certainly” nine times and deleted at least another half-dozen certainlys in the editing process. Like most trained engineers, Finke doesn’t have an impulsive gene; he is measure twice, cut once, not unlike the disciplined chap that invented due diligence. “Cut once” people often use the word “certainly.” It reveals their logical disposition and confident character. Finke is board chair of the 400-member Minnesota Telecom Alliance, which represents and advocates for Minnesota’s telecommunications industry in St. Paul. He is a Greater Mankato Growth board member and Southern Minnesota Advocates member, and has been involved with South Central College Foundation and Greater Mankato United Way. He confidently leads publicly traded HickoryTech (HTCO) in the wake of a stormy wireless venture. Its relatively new business-to-business Enventis sector unexpectedly accounts for 51 percent of company revenues, and through aggressive Enventis, HickoryTech has branched out nationwide. According to Finke, the company is the fourth largest telephone company in Minnesota—and in Iowa. You can’t give President John Finke all the credit for HickoryTech’s resilient rebound. But he deserves a great deal. Certainly. Certainly my mom and dad, from the perspective of work ethic. I was born in St. Louis and we moved to East Alton, Illinois, when I was five. There were six of us children, and we were able to have many different kinds of experiences growing up, such as working around the house, taking rifle lessons on Saturday mornings, and playing basketball, baseball or football. We raised our own vegetables in a garden. What I remember most was my parents’ discipline and their teaching us that good things just don’t happen. You have to make them happen. They taught us to treat people the way we would want to be treated. My mom was a nursery school teacher and my dad worked at Winchester Western. Even though working full days and having six kids, they always took time for us. We were self-sufficient when it came to doing things around the house. For example, when building a porch or patio, we dug the trenches ourselves and poured the cement right from the truck. We did our own electrical wiring. Our dad built a base upon which we learned you just don’t pick up the telephone to ask or hire someone to do things you can do yourself. My mom would do anything for her children. She is very open, friendly, and caring. But if we stepped over the line, we knew what would happen. They are a great balance—opposites in some ways. My dad was strict, direct, and business-like. Mom was more nurturing. You have to be nurturing to teach nursery school. My parents were pretty strict. I had to walk by their set of rules, and it was a good foundation to expand upon. Growing up, I learned from every opportunity given. I saw how they and others acted and reacted to certain situations. That formed the basis for who I am and what I wanted to become. What did your dad do at Winchester Western? The company makes shotgun and rifle shells. My dad was involved in engineering and manufacturing, helping design equipment on the manufacturing lines and managing people—from the employees who made the primer that makes the shells fire to the line assembling the shells. So it was a natural for you to major in engineering at the University of Missouri-Rolla? In part, I was drawn to engineering because of my background of having so many opportunities to figure out how things work. I was always asking, How does this work? How does that work? What can I do to make it better? That experience included working on cars, putting in a concrete patio, doing brick work, changing lawn mower blades, running electrical wire—I learned how to do many different things. While in high school, I worked for a small family operation, W.J. Counton Oil Company. Basically, we spread oil and rock on rural roads and city streets. I learned a lot about business from them. As a 16-year-old, I was given opportunities many kids don’t have. Jeff and Melodie taught me about business and how the world operates. I earned enough money to put myself through college. From a small business perspective, I experienced the ups and downs of being able to make a difference. You could make a positive or a negative difference, depending on how hard you were willing to work and what you were willing to do. Working there gave me the grounding for what would later bring me to HickoryTech. Was there another person or event there that shaped you? My father-in-law, Ed O’Neill. He passed away a year ago, and he was always a good check and balance for me – both personally and in business. We had a great relationship and I miss him a lot. Also, I was hired right out of college in 1984. When interviewing with Contel, what intrigued me about them was being able to work for a business with a small-company atmosphere. My first job was to design cables and facilities, and manage the costs, oversee construction, and track the cost through—kind of manage the product from start to finish. Even though operating in 20 or so states, Contel, in other words, operated each state separately. They had properties throughout Indiana. It was more like a family. The focus was on improving the quality of telephone service in rural communities. So what I hear you saying is they didn’t pigeonhole you into one specialty—you were able to take on many responsibilities? Yes, and that helped me grow. After about the first year, I went from designing facilities to designing central office equipment that involved the conversion from analog switching to digital switching equipment. In this job, I learned a totally different part of the business. They were trying to see how much responsibility I was able to handle. How shall I say this: You aren’t the most outgoing person in Mankato. You have a bachelor’s degree in civil engineering—not in marketing or public relations. Prior to being named HickoryTech president you were involved with the nuts and bolts of the business. Now you have to publicly address shareholders. Are you comfortable being the public face of HickoryTech? That’s been challenging. When looking over the requirements of the job, I knew this area would be one of the challenges. But you surround yourself with people to help you in areas you don’t have strength. I certainly am more comfortable today doing it than before. Right before you go on stage—at a conference or a shareholders meeting—what’s going through your mind? I would prefer that events be a sit-down meeting where the conversation is done casually across a table rather than formally standing up in front of a group with an oral presentation. It’s easier for me if I envision the event from that perspective. Do I know what questions they are going to ask? No. You never do. But I’m also very comfortable with our business and what we have and will accomplish. Larry Morales and Tom Borchert did, as director of engineering for Mankato Citizens Telephone Company. I had never been to Minnesota before. When I came here, if that position had been my last job ever, I would have been satisfied. I didn’t come here planning to move up in the organization. I came with the perspective of moving back to a smaller company where I could contribute and make a difference. Also, Tammy and I were looking for a place to raise our children in an environment not unlike East Alton, Illinois. Larry and Tom were down-to-earth people. They looked at the world a whole lot differently than the corporate environment I had just come from at GTE. It all seemed to tie back to my experience working at a smaller company, and of feeling as if I knew everyone and that I could make a difference. That’s the feeling I got from talking to Larry and Tom when I came here for the interview. The interview and trip went great. I remember getting on the plane going home, and thinking, “If this works out, I’m going to go.” Tammy has always been supportive of my career. She and I are opposites. She is very comfortable around large groups of people, and outgoing. She fills some of my voids. It has been a great move for both of us. In 1997, the year after I started at HickoryTech, we expanded into Iowa, purchasing properties from Qwest. That was the real reason my job was created as director of engineering. The company was expanding and the Telecommunications Act opened us up for expansion. We began as a competitive local exchange carrier in Nicollet, and then went to St. Peter, Waseca, Ellendale, New Richland, Janesville, and other communities. (The presence of a CLEC gives people the opportunity to choose a different local telephone service provider.) While going through the CLEC expansion, we started looking at ways to grow the business-to-business side of our company. We built fiber optic routes to the Metro area and were selling business services on them. At that time, as luck would have it, we were looking at ways to expand, and Allete was looking to sell Enventis Telecom. Were you involved in putting together the deal to purchase Enventis? I was involved in the due diligence, including the financial modeling. I thought Enventis would be a great fit and acquiring it allowed us to expand our fiber network and our business-to-business strategy much quicker than if we would have tried building it piece by piece. It gave us the talent and more of an entrepreneurial spirit, and certainly gave us a set of new products, services, and a fiber network that extends throughout the state. When doing an acquisition, you try to make sure you understand the growth profiles; not only the top-line revenue, but also the expenses, and eventually how it will affect the shareholders. That last part was new to me. Having to analyze potential cost and revenue is one thing, but how it will show value for your shareholders is another. By 2003, your venture into wireless had not gone well. Also, it must have been obvious that landline wouldn’t be growing. Could a person say that HickoryTech’s acquisition of Enventis just three years ago, in certain respects, saved the company? Right now Enventis makes up more than 50 percent of HickoryTech’s total revenue. I don’t know if I would say it saved the company. But having Enventis does give us the ability to grow. Our opportunities to grow the existing core business certainly had diminished. Without Enventis, we would have been looking at how to manage a declining business and somehow provide employees with growth opportunities. I don’t look at it as saving the company. There are a lot of companies who are currently in our former position who have continued operations. I will say the acquisition sure set us up to grow in a way that would have been very difficult had we stayed the same. Hasn’t the Enventis revenue stream helped you expand into areas such as DSL and digital television? We started offering digital television in St. Peter in 2001, and spent a couple years evaluating the model. In 2004-06, we expanded that into Waseca, Janesville, New Richland, St. Clair, Eagle Lake, and other communities. At the same time, we were investing heavily in our Mankato infrastructure so we could provide those services here. Some telecommunications companies have chosen not to make the investment. Because of it, we have attained double-digit growth in our broadband services, such as digital television and DSL, while at the same time growing business-to-business services. We provide Digital TV to 11 communities today. So far we’ve talked mostly about “me.” I prefer talking about “we” in this interview. I certainly believe the company needs leadership, and needs to understand where it’s going; but our company really is successful because of our employees. They take our strategy, and business plans, and turn them into reality. I realize that at the end of the day company health is my responsibility, but they are key. Our success depends on their abilities to relate to our customers, understand their needs, and apply the technologies into a service the customer wants and needs and finds value in. Almost every product we sell can be bought, installed or made by someone else. But it’s our service and commitment—it’s that follow-up—that makes the difference. Although, we may not have employees in every community we serve, we contribute financially and in other ways to our communities. We believe giving back to the communities we serve is part of our responsibility and clearly a part of our history. Telecommunications stock has been hammered the last few years. Your share price is way down historically. Yet your dividend rate is over eight percent and the company is growing rapidly again thanks to the success of Enventis. Why aren’t more people purchasing HickoryTech stock as a safe haven? Part of it: the whole down market has negatively affected our stock. In communications, there is certainly a lot of talk about technological changes, increased competition and a changing regulatory landscape. These factors affect to some degree the share price of all the companies in our industry. Many companies in our industry have not diversified their revenue streams—and by diversifying, I don’t mean HickoryTech will be buying gas stations. I mean diversifying within the communications industry. That we’ve been able to grow the company through the growth of Enventis and broadband services. We have been able to offset declines in traditional core businesses with new lines of business. Many companies haven’t done that. When investors look at our sector, they are wondering about the next step a company will take in order to grow. But looking back over your company history: In the early ‘60s, your company purchased a company in Sleepy Eye to print telephone books. That company became Advertising Unlimited, which you sold in the ‘70s. Could there be a day when HickoryTech purchases a company outside its core business area, such as one that could provide broadcast content for your Internet and digital television ventures? We have some lines of business outside our legacy services. Our National Independent Billing business sells billing software and customer care solutions to the telecommunications industry. It also provides our own billing and customer management software. As for content—that would be hard for us to purchase, manage and compete in the industry the way it is going. Some competitors in that market are Google and Microsoft, which have national and global footprints, capabilities, skill sets. Our vision is to provide content to the end user through adding value in-between. We want to be the pipe that allows content to flow to the customer. I don’t think we are going to be able to play and compete in the development of technology and of the content. But we can provide the value to link them to the content they need. In your July earnings conference, you were quoted as saying, “We believe there are select opportunities to expand our business portfolio.” What sort of opportunities are out there? In general, the opportunities are any additional business services that would help grow our business-to-business strategy. There may be opportunities to expand through what I call our targeted, business CLEC strategy. There are opportunities with mid-band Ethernet and data center services. Basically, we are looking for opportunities that can link with our current business services—an expansion of the product line rather than a new one. As a small company, we already offer a fairly large number of products and services. It would build on our expertise without diluting our focus. We need to find a way for the people providing the connection to the customer to get paid for that investment. A lot of content providers believe they should be able to use the Internet at no cost. In other words, they are using your freeway and making you pay for the asphalt and cement. Correct. There is a cost to build that last mile, whether wireless, wireline, cable or fiber. There needs to be a mechanism for companies to invest in rural America and provide the infrastructure. Is voice over Internet protocol generally good or bad for your business? Both. We play both sides. Our Enventis business is built on voice over IP technology, which is the convergence of voice and data over one network. It certainly has provided a lot of growth for us—not just from the voice side or selling equipment, but also in transporting of that traffic from point A to point B. To take advantage of unified communications, there has been growth in the data networks, the wide area networking connections—that links a corporate office to remote offices. We are set up with our statewide fiber network to provide those connections. We also work with nationwide carriers to provide connections outside Minnesota, so we can develop networks for customers like Cambria. Our fiber into their building provides network services to a number of their plants, including several outside Minnesota. We centrally manage the network here. The Enventis acquisition means we are no longer just a Minnesota/Iowa company. We provide services for companies all over the United States. A customer may be based out of Minneapolis, but have offices located around the country. We provide a hosted, unified communications service program, and own the infrastructure. They access it and pay on a site- by –site, user-by-user basis. We bring all their remote locations back to Minneapolis from locations such as Ohio and Pennsylvania. The downside for us is that VoIP adds another form of competition to our core services. Will landline telephone one day pass away into the night? Landline telephone, as we once knew it, possibly. But not in five years or not likely in ten. The rate of change will have lots to do with generational changes and the ability of people to adapt and become comfortable with new technology. Landline is a security blanket for many people as it’s not subject to weather or power outages. And you are delivering other services over it. The need for increased bandwidth, information, and data will continue. There will be a time when voice, Internet, and entertainment services will all come across the same pipe. Television services will be different ten years from now, too. People are already watching television on their laptops and in the future there will be more integration of the Internet and video entertainment services. Would HickoryTech ever get back into wireless? It would be more through a partnership than an investment in licenses and in managing the business. Some day we likely will work with a wireless provider and provide integration between our wireline, voice and data video network to a wireless provider. It’s very possible and probable. Again, this would be a partnership where we do what we do best, and let the wireless company do what they do best. The Minnesota Telecom Alliance: You are the chair. The purpose of MTA is a means for the independent telephone companies in Minnesota to have a unified industry voice at the state legislature and with state commissions. We have approximately 100 companies as members, who wouldn’t have the resources individually to have that voice. We have a lobbyist to provide a linkage to state government and we have committees that allow our companies to understand the regulations and what they mean to their companies, as well as to develop legislative agendas. How does HickoryTech fit statewide in terms of size for a telecommunications company? As for our telephone business only, we’re in the top four both in Minnesota and Iowa. Really, there is no easy way to measure how we stack up versus others in the industry. Part of what makes us different is our diverse revenue stream. With investors, our profit margins and revenue per customer are often compared to telephone companies. Yet we have all these other businesses that are in highly competitive environments with lower margins. We sometimes get overlooked by people not taking the time to understand the details of our business. The decision to go for Enventis: You were probably holding your breath and crossing your fingers after. You went through a difficult period with wireless, and you were probably thinking if you messed this up, it would be especially serious for the company. Did you think when the company purchased it, that Enventis would succeed as well as it has? It is fair to say we have exceeded growth expectations for Enventis. To be honest, I never looked at it as possibly failing. When looking at acquisitions, you certainly model the up and down sides to see what the impact will be financially. I don’t remember ever having a conversation with anyone about the business potentially failing. Going in, our focus was to make it work. We as a company and the board realized we needed to pursue growth opportunities for our business. We needed to find a way to grow. Wireless didn’t work out the way we’d planned; however, standing still and doing nothing was not a viable long-term solution for the company. Sometimes you take risks and they work. Sometimes they don’t. That’s right. A lot of acquisitions—you can read the books on them—more fail than succeed. We have been very successful in integrating acquisitions for the most part. What did you learn from your experience under former presidents Bob Alton and John Duffy? I learned from observing their differences and through what I would do differently. I always look at the world from the standpoint of what I can do better. That’s part of my engineering training. It’s who I am. When looking at things, I am consciously putting that through the lens of not only what Bob or John did, but also through all my experiences, including through the lens of what people in the community have done. The making of a business decision is always based on a point in time. Even John or Bob would have done something different given a different set of circumstances. John managed the company at a different time than Bob. So you make different decisions. I don’t necessarily look at it as doing things they did or didn’t do, but how do I apply that experience to the decisions I have to make. If you look at HickoryTech’s history, most presidents stay a long time. You are only 47. Can you see yourself here in 20 years. (Long Pause.) I don’t think so. And not because I don’t see myself in this community 20 years from now—I hope I am still here. But I think companies need change. What I bring to the company is right for it at this point in time. In other words: Different times require different people? Absolutely. Different people bring different skill sets. As the world, industry, and technology evolve, the company may need different skill sets. At a leadership position, sometimes you need change to create energy. I hope to be around a long time. But I’ll be around only as long as I am contributing positively. If I get to the point where I’m not contributing, then I have to do something different. That would be a personal decision, but it would also be good for the community, employees, and organization. One reason I came to HickoryTech was to get back to having a balanced life, being part of a community, doing things with my kids, seeing them grow up, and being able to participate in that. This company has been great at helping me do that. It certainly gives people, like myself, the opportunity to coach a youth soccer team or see a hockey or soccer game. That’s part of the balance the company has given me. We expect people to work hard, but we’re flexible. For me, spending time with family helps release some of the stress of work and provides overall balance. Whatever you do with this interview, mention the part of my wife, Tammy, being supportive. She gave up her career early in life to help raise our children. We moved away from our families at a young age and she has stuck with me throughout. Born: May 21, 1962, St. Louis, Missouri. Family: Wife, Tammy; children, Alex and Alyssa. Education: B.S. in civil engineering, University of Missouri-Rolla; M.B.A. in business administration, Indiana Wesleyan. Current community and professional involvement: Minnesota Telecom Alliance, chair; Greater Mankato Growth, board; Southern Minnesota Advocates. Former community involvement: South Central College Foundation, board; Greater Mankato United Way, board. 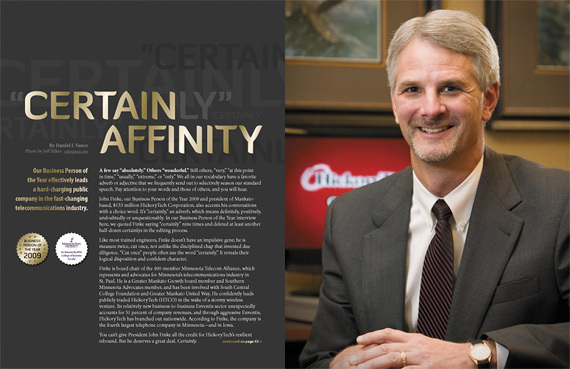 “The College of Business at MSU, Mankato is honored to partner with Connect Business Magazine to help select the Business Person of the Year 2009.” – Dr. Scott D. Johnson, dean, College of Business, Minnesota State University, Mankato. For the fourth straight year, a team of MSU College of Business professors, working from Connect Business Magazine reader nominations, chose our Business Person of the Year. They based their unbiased decision on each nominated person’s business results, leadership abilities, community involvement, and character. HickoryTech President John Finke is our fifth Business Person of the Year, an award first given to Lorin Krueger in 2004. Past winners have been Milt Toratti (’05), Robert Weerts (’06), Roxie Brandts (’07), and, in 2008, Jeff Thom. This year’s runners-up were Dale Brenke of Schmidt Siding and Window and Sam Gault of Nicollet County Bank.